Back on October 7, when the Congressional Budget Office reported that the federal deficit had ballooned to a massive $1.4 trillion during President Obama’s first year on the job, Katie Couric’s CBS Evening News did not tell viewers. 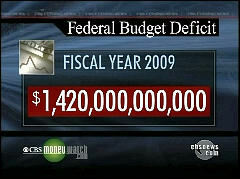 But Couric finally caught up to the bad news after the Obama White House put out its final numbers on Friday afternoon. Economists generally agree that annual deficits should not exceed 3 percent of the GDP, and that is the level President Obama had vowed to reach by the end of his first term in 2013. But subsequent spending and tax cuts to stimulate the economy, and lower-than-expected revenues as the recession deepened before bottoming out, combined to push the administration’s deficit forecast to 4.6 percent of GDP for the fiscal year 2013. At 10 percent of the gross domestic product, the 2009 deficit is the highest since the end of World War II, when it was 21.5 percent. At that level, it already has become a bigger economic and a political issue than any time since the late 1980s. As to President Obama’s vow to slash the deficit by the end of his first term, perhaps more media skepticism would be warranted. The Heritage Foundation produced an excellent chart last March (before the big health care debate) comparing the deficits under President George W. Bush, which President Obama frequently derides as “the mess” he inherited, and those projected for the next ten years under Obama’s policies. It shows Obama’s red ink towering over the over-spending of the last eight years. Of course, if President Obama’s solution is to tax the rich, tax health insurance, tax energy and anything else that moves, the deficit may be smaller as a percent of GDP but the government’s share of the economy would be much larger, supported by a shrinking private sector. Maybe a little media skepticism of that would be warranted, too — but I’m not holding my breath.